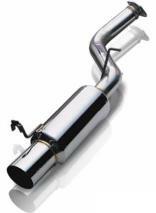 Looking for an exhaust system? At MB Service Centre we carry a massive range of top brand car exhausts. The gases then pass through a silencer or muffler. It’s only when you hear a car with a damaged silencer that you realise what a huge difference it makes to reducing noise levels. The silencer on your exhaust contains a deceptively simple set of tubes that are finely tuned to reflect the sound waves produced by the engine so that they cancel each other out. Finally the exhaust fumes exit via the tail pipe at the rear which carries gases away from the vehicle and the passengers inside. All of the components of an exhaust system are connected with a series of clamps, hangers, flanges and gaskets.